A sadly little-seen and underappreciated gem in the ghost romance pantheon is Ghost Of the Mirror from director Sung Tsun-Shou. Significant for being the first major role for Brigitte Lin it is overlooked in favor of Shaw Bros The Enchanting Shadow (1960) and Tsui Hark’s A Chinese Ghost Story (1987), both of which tell the same story. 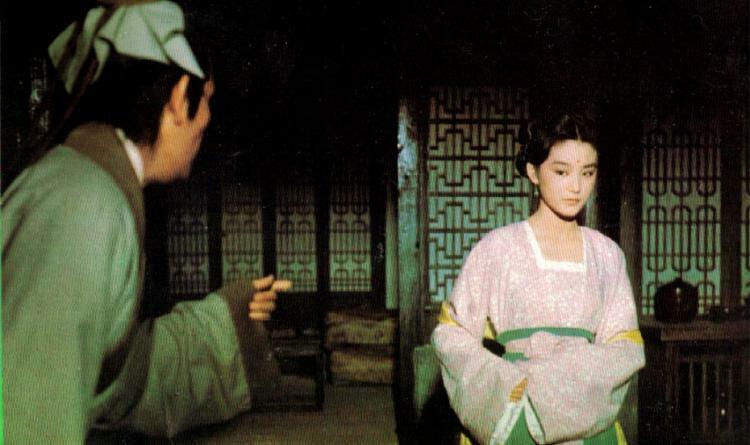 Headed by Shih Chun from A Touch Of Zen (1961) and helmed by a director that specialized in drama and romance Ghost Of the Mirror is a historical curiosity that shouldn’t be the obscurity that it tends to be. Lin and Sung Tsun-Shou joined forces once again for the romance The Story Of Green House (1980). Ghost Of the Mirror is in dire need of a proper restoration. Hopefully some company will rise to the task of properly restoring, remastering and subtitling this forgotten piece of ghost romance history for rediscovery for the English-speaking world. Brigitte Lin is one of the great leading ladies of Hong Kong cinema, a veritable queen of the period costume and fantasy wuxia genre, and a multiple Taiwan Golden Horse Award nominee. She was a veteran from over 100 movies. Of the four movies that Lin acted in in 1973-74 Ghost Of the Mirror was the most significant for being her first major role. 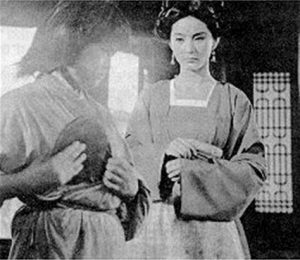 Lin was a staple in Taiwanese dramas and romance and Ghost Of the Mirror was her earliest period costume wuxia of note. Lin is often remembered for her cross-dressing roles in The Dream Of the Red Chamber (1978) and her celebrated reinvention under Tsui Hark in Zu: Warriors from the Magic Mountain (1983) and Peking Opera Blues (1986). Brigitte Lin is an actress from the non-verbal school of acting who conveys more with just her eyes and face than most other actors do with the combination dialog and gestures. Ghost Of the Mirror, for all intents and purposes, is a loose adaptation of Pu-Sing Ling’s Strange Stories from a Chinese Studio which had been adapted earlier with Shaw Bros The Enchanting Shadow (1960) with Chao Lei and Betty Loh Tih and a decade later with Tsui Hark’s A Chinese Ghost Story (1987) with Leslie Cheung and Joey Wong. Chang Yung-Hsiang was a Taiwanese screenwriter that specialized in romance. While all the characters and locations have different names it’s rather evident that Ghost Of the Mirror is a direct imitation of Pu-Sing Ling’s most famous work without infringing upon the copyright. It too follows a righteous scholar in a remote location who falls for the charms of a doomed maiden, ensnared by a malignant force he can’t possibly begin to comprehend. It was probably down to a lack of resources that Ghost Of the Mirror wasn’t able to secure the licensing rights for their adaptation of the work. The score too seems randomly put together from stock library music as well as cues from Akira Ikufube's theme from Zatoichi and the One-Armed Swordsman (1971) and the various darker, slightly spookier moments of Pink Floyd’s ‘Echoes’ from 1971’s “Meddle”. An unnamed Buddhist scholar who everybody refers to as Young Noble (Shih Chun) is instructed by his ailing mother (Chang Ping-Yu) to copy a number of sacred Sutra a hundred times to appease the gods to improve her failing health. To that end Young Noble agrees to relocate to remote, quiet surroundings, abstaining from consuming meat and liquor, bathing regularly, and avoiding the company of women. He sends his young servant Ching (Chiang Wei-Min) to scout a possible location and soon the moving is underway. Ching believes the well on the property is haunted but Young Noble discounts it as mere childish superstition. As he prepares himself to start copying the Sutras he soon feels a presence inexplicable. He soon discovers that the house is haunted by Su-Su (Brigitte Lin, as Pai Yin), the ghost of a girl drowned in the well who can only come out at night and is forced to kill people in servitude to the Dragon. Ching eventually finds a mirror in the well and when Young Noble sends him away after his find the mirror turns out to contain the essence of a second ghost, Yuenyi (or Yao Ying) who looks exactly like Su-Su but has a completely different personality. Under the influence of her malefic enslaver Yuenyi attempts to strangle Young Noble with her sari but she resists the Dragon’s ectoplasmatic force as she deems him too righteous to kill. As a lifedebt of sorts for resisting the Dragon’s power Yuenyi suggests to be his servant for the duration of his assigned transcription task. Enamored of both the reserved Su-Su and the more enterprising Yuenyi, Young Noble explores the caves beneath the well and finds a bronze mirror in a box. Now that the mirror is out in the open it allows Su-Su and Yuenyi to keep him company in daytime as well. As time elapses Su-Su and Yuenyi start to merge into one. At this point Young Noble’s mother pays her dutiful son an unexpected visit at the isolated mansion and is initially disappointed to find him in the presence of a woman, something which he agreed to abstain from. Su-Su/Yuenyi explains that her intentions are nothing but honorable, and the old matriarch allows the two of them to be together, knowing full well that Su-Su/Yuenyi is a ghost. On the way back to the abandoned mansion the two run into a devilish old lady who turns out to be a manifestation of the Dragon. Young Noble continues with the completion of his transcriptions and the two decide to shield the house with Sutras he has already finished as a measure against attacks from the Dragon. In the night the Dragon attacks the mansion to reclaim his prized possession, Su-Su/Yuenyi. While he’s unable to save Su-Su/Yuenyi from certain death, Young Noble’s righteousness is powerful enough to exile the Dragon from the realm of the living, at least for the time being. The on-screen romance between Shih Chun and Brigitte Lin remains quite chaste at all times. The contrasting personalities of Su-Su and Yuenyi allow Lin to showcase her versatility as an actress – and even this early on it’s clear that she was destined for superstardom given the proper means and vehicle. Su-Su is very reserved, aloof and content in her subservience while Yuenyi possesses a greater joie de vivre. She loves to dance, wears colorful veils and has an overall more positive frame of mind. Obviously the victim of a great tragedy the heart of Su-Su/Yuenyi is restored when she makes her acquaintance with Young Noble. Lin’s breakthrough would come with Tsui Hark’s mythological spectacle Zu: Warriors from the Magic Mountain (1983). In some two decades hence from Ghost Of the Mirror – and after some considerable career peaks in between – Lin would find herself on the lower end of the spectrum once again with the disastrous and widely derided Louis Cha adaptation Dragon Chronicles – The Maidens of Heavenly Mountain (1994). Ghost Of the Mirror has been largely eclipsed by the two adaptations before and after it. 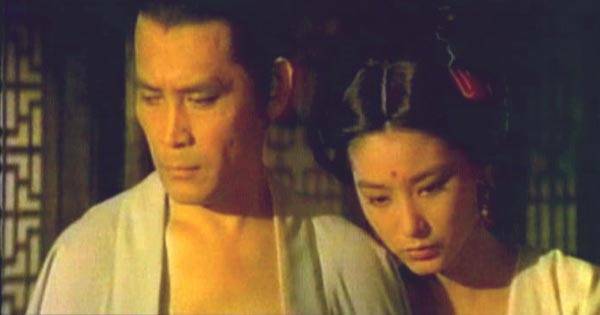 Shaw Bros’ The Enchanting Shadow (1960) and Tsui Hark’s A Chinese Ghost Story (1987), both told of a doomed and tragic romance between a Buddhist scholar and a ghostly maiden, and did so with far higher production values and to much greater effect. In its defense it isn’t as if Brigitte Lin wasn’t a suitable alternative to Betty Loh Tih and Joey Wong. Screenwriter Chang Yung-Hsiang certainly hits all the right notes in the story and the doomed romance between the two lovers is well-developed enough to make the ending fittingly tragic. The production is hampered by its obvious lack of resources but thankfully director Sung Tsun-Shou is able to do a lot with very little. The special effects-heavy finale is where Ghost Of the Mirror betrays its low-budget nature as much of it is puppetry and miniatures with sometimes very visible strings. Budgetary limitations notwithstanding Ghost Of the Mirror is a charming little movie that has been relegated to obscurity despite Brigitte Lin’s later international stardom. It might not have the rustic charm of The Enchanting Shadow (1960) or the mad frenetic energy, the slapstick comedy and the oh so bittersweet romance of A Chinese Ghost Story (1987) yet Ghost Of the Mirror is perfectly capable of holding its own. There are obviously superior, and better realized, examples of the form but Ghost Of the Mirror has much of the same creaky, rickety charm as those poorly funded Mediterranean gothic horror genre pieces that arrived in the wake of American Edgar Allan Poe adaptations. Ghost Of the Mirror draws from a different literary source and – mythology, but its objectives are largely the same. That Ghost Of the Mirror is overlooked in favor of its better known brethren is understandable. As serviceable and occassionally atmospheric as it it, it isn’t some lost classic or overlooked gem. As a historic curiosity it is interesting purely for being Brigitte Lin’s first major role. Other than that it’s a by-the-book Chinese ghost story that abstains from the overt craziness that came to define the post-A Chinese Ghost Story (1987) exercises in the genre. A little goes a long way and a little of Brigitte Lin in her earliest role of note is so much more than just that.